Penguin carbon cartridges with an impregnated carbon filter are a one-step carbon and filtration treatment. These cartridges eliminate the problems associated with loose carbon treatment and the need for a separate filtration system. The standard cartridge measures 2 3/4” OD with lengths varying from 4” to 40” and flow rates up to 2 1/2 gpm. These cartridges are designed to be used in either single or multi-tubed vessels. Penguin carbon cartridges are available in 4 different styles. Style GC is an outer wound cartridge which utilizes a special high grade activated granular carbon with a very low sulfur content. Style CP is also an outer wound cartridge which features layers of paper impregnated with activated powdered carbon. Style C is a porous polyethylene shell containing high grade activated granular carbon. Style M features an outer layer of polyolefin webbing with an impregnated carbon powder interior and the impregnated carbon filter is constructed with an outer layer of polyolefin and synthetic fibers which removes solid particles and protects the inner carbon powder layer from premature clogging..
PENGUIN STRING WOUND FILTERS are a premium line of carbon and polypropylene string media specifically designed for general-purpose water filtration. These dual purpose cartridges filter out fine sediment particles, reduce unwanted taste, odor and chlorine from a single cartridge. 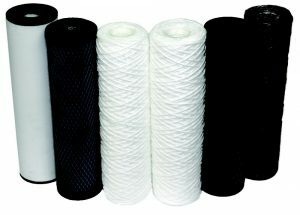 The unique blend of 50% carbon and 50% polypropylene within the fiber assures uniform filtration as well as consistent carbon content throughout the life cycle of the UPC cartridge. PENGUIN CARBON CARTRIDGE – STYLE C feature a porous synthetic polymer pre-filter outer shell filled with high grade activated coconut carbon (see cutaway showing layers) and have been designed primarily for use in removing organics such as oil mist, water vapor and fine dust and scale particles and particulate contaminates from plating, acid, alkaline and hydrocarbon solutions. Most oil/water contaminants will be trapped and collected on the shell.